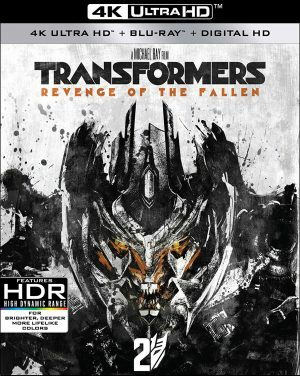 ‘Transformers’ films on 4K UHD, ‘Despicable Me 3,’ ‘Midsomer Murders,’ More on Home Entertainment … Plus a Giveaway!!! TRANSFORMERS: REVENGE OF THE FALLEN. 4K. (DVD Artwork). ©Paramount. Just in time for holiday gift-giving, Paramount Pictures will be releasing all four of the blockbuster “Transformers” films on 4K UHD beginning Tuesday Dec. 5. Filled with eye-popping action and stunning visuals, these films deliver the kind of entertainment experience that completely engulfs the viewer. Watching them on 4K UHD quite literally transforms home viewing into something more immersive and more visceral than ever before. “Transformers, “Transformers: Revenge of the Fallen,” “Transformers: Dark of the Moon” and Transformers: Age of Extinction,” are the new “Transformers” titles available in this format. “Tranformers: The Last Knight” already is available on 4K UHD. All releases come in a three-disc 4K UHD/Blu-ray Combo Pack with Digital copy, so you can download it onto your handheld electronic device. Michael Bay directs and Steven Spielberg produces the original “Transformers,” in which a thriller battle is waged between the Autobots and the Decepticons. When their epic struggle comes to Earth, all that stands between the evil Decepticons and ultimate power is a clue held by Sam Witwicky (Shia LaBeouf). The sequel, “Revenge of the Fallen,” the battle for Earth continues with college-bound Witwicky (LaBeouf) learning the truth about the ancient origins of the Transformers. He must accept his destiny and join Optimus Prime and Bumblebee in their epic fight against Decepticons, who have returned to Earth stronger than ever with a plan to destroy the planet. “Dark Side of the Moon” reveals a mysterious event from Earth’s past that threatens to ignite a war so big that the Transformers alone will not be able to save it. Witwicky and the Autobots must fight against the darkness to defend the world from the Decepticons’ all-consuming evil. In “Age of Extinction,” humanity faces extinction from a terrifying new threat. It’s up to Optimus Prime and the Autobots to save the world. But now that the government has turned against them, they’ll need a new team of allies, including inventor Cade Yeager (Mark Wahlberg) and the fearsome Dinobots. Each of the titles is loaded with multiple bonus features. They include multi-angle sequences, deleted and alternate scenes, deconstructed scenes, concept art and more. Raking in more than $949 million in global ticket sales, “Despicable Me 3” makes a great holiday gift, with almost an entire hour of exclusive bonus features including an all-new mini-movie, a never-before-released deleted scene, and much more. Illumination, the studio that brought you “Sing,” “The Secret Life of Pets” and the “Despicable Me” franchise, continues the adventures of Gru and his family in “Despicable Me 3.” After he is fired from the Anti-Villain League for failing to take down Balthazar Bratt (Trey Parker, “South Park”), the latest evil mastermind to threaten humanity, Gru finds himself in the midst of a major identity crisis. But when a mysterious stranger shows up to inform Gru that he has a long-lost twin brother—a brother who desperately wishes to follow in his twin’s despicable footsteps—the former super-villain rediscovers just how good it feels to be bad. Carell (“Foxcatcher”) reprises his hilarious role as reformed criminal mastermind Gru, as well as his newly discovered twin, Dru. The all-star voice cast also features Kristen Wiig (“Despicable Me 2”), Miranda Cosgrove (“Despicable Me 1 & 2”), Steve Coogan (“The Secret Life of Pets”), Jenny Slate (“Zootopia”), Dana Gaier (“Despicable Me 1 & 2”) and legendary singer and actress Julie Andrews (“The Sound of Music,” “Mary Poppins”). “Despicable Me 3” will be available on 4K Ultra HD in a combo pack which includes 4K Ultra HD Blu-ray, Blu-ray and Digital. The 4K Ultra HD will include all bonus features on the Blu-ray disc. Some things are better left buried in “Valley of Bones,” the gripping crime-thriller debuting on DVD and digital Tuesday Dec. 5 from Sony Pictures Home Entertainment. Dan Glaser (“Pinching Penny”) co-wrote and directs this nail-biting adventure thriller starring Autumn Reeser (“The O.C.”) as a disgraced paleontologist who is tipped off to a groundbreaking dig site in the North Dakota badlands by a recovering meth addict, whose connection to a deadly drug cartel threatens to bury them both under the weight of their criminal pasts. With an ensemble cast that includes Rhys Coiro (“Entourage”), Steven Molony (“Oxenfree”), Alexandra Billings (“Transparent”), Bill Smitrovich (“Grey’s Anatomy”), Muse Watson (“NCIS”) and Emmy Award nominee Mark Margolis (“Breaking Bad”) and set against a North Dakota backdrop, this taut drama unearths non-stop twists and turns that’ll have viewers thrilled to the bone. Anna (Reeser), a passionate but disgraced paleontologist, embarks on a journey through the badlands of western North Dakota in search of a potentially historic fossil. Word reaches Anna that Wes McCoy (Molony), a recovering meth addict with unpaid cartel debts, has stumbled upon a large Tyrannosaurus Rex tooth. Determined to find the bones at any cost and undo her past mistakes, she teams up with McCoy, along with her late husband’s brother and her estranged son, and finds herself entangled in a dangerous game that tests whether she will move on from her past, or be consumed by it. Spanning 53 movies and 41 editions of the Olympic Summer and Winter Games, Criterion’s upcoming, one-of-a-kind “100 Years of Olympic Films” collection assembles, for the first time, a century’s worth of Olympic films—the culmination of a monumental, award-winning archival project encompassing dozens of new restorations by the International Olympic Committee. It is available on Tuesday Dec. 5 in deluxe Blu-ray and DVD collector’s sets. These documentaries cast a cinematic eye on some of the most iconic moments in the history of modern sports, spotlighting athletes who embody the Olympic motto of “Faster, Higher, Stronger,” Jesse Owens shattering sprinting world records on the track in 1936 Berlin, Jean Claude-Killy dominating the slopes of Grenoble in 1968, Joan Benoit breaking away to win the first-ever women’s marathon on the streets of Los Angeles in 1984. In addition to the work of Bud Greenspan, the man behind an impressive 10 Olympic features, this stirring collective chronicle of triumph and defeat includes such landmarks of the documentary form as Leni Riefenstahl’s Olympia and Kon Ichikawa’s Tokyo Olympiad, along with lesser- known but captivating contributions by major directors like Claude Lelouch, Carlos Saura and Milos Forman. It also serves as a fascinating window onto the formal development of cinema itself, as well as the technological progress that has enabled the viewer, over the years, to get ever closer to the action. Traversing continents and decades, and reflecting as well the social, cultural, and political changes that have shaped our recent history, this remarkable marathon of films offers nothing less than a panorama of 100 years of human endeavor. The collector’s sets include a lavishly illustrated, 216-page, hardcover book, featuring notes on the films by cinema historian Peter Cowie; a foreword by Thomas Bach, President of the International Olympic Committee; a short history of the restoration project by restoration producer Adrian Wood; and hundreds of photographs from a century of Olympic Games as well as new scores for the silent films, composed by Maud Nelissen, Donald Sosin and Frido ter Beek. RLJ Entertainment will release “The Osiris Child: Science Fiction Volume One” for an SRP of $29.96 and on Blu-ray/DVD combo for a suggested retail price (SRP) of $34.97. When a dangerous outbreak threatens to destroy everyone living on a newly colonized planet, Lt. Kane Sommerville (MacPherson) goes against orders and leaves his station to rescue his young daughter (Teagan Croft). Desperate to get to her before it’s too late, Kane enlists the help of an escaped prisoner (Lutz) as they battle their way through the chaos of a planet on the verge of annihilation. With the odds stacked against them, saving his little girl may be humanity’s last chance at survival. The DVD and Blu-ray/DVD combo have bonus features that include deleted scenes, music videos, a photo gallery, a concept art gallery and five making-of featurettes. “Midsomer Murders: John Barnaby’s First Cases,” features 14 episodes of one of Acorn’s top series. The DVD set is available Tuesday Dec. 5. The cozy villages of Midsomer County reveal their most sinister secrets in this hit British mystery series that has earned a worldwide following. In this collection of Series 14 and 15, John Barnaby (Neil Dudgeon, “Life of Riley”) takes over as Midsomer County’s new Detective Chief Inspector, solving macabre crimes with the help of DS Ben Jones (Jason Hughes, “This Life”) in his last cases as Barnaby’s assistant. Guest stars include Samantha Bond, Edward Fox, Pam Ferris, Warren Clarke, James Callis, Julie Graham, Kerry Fox, Sinead Cusack, Hattie Morahan, Martine McCutcheon, Kate Ashfield, Charity Wakefield, Kevin Doyle and Harriet Walter. The seven-disc set includes 14 episodes plus bonus behind-the-scenes featurettes, with an SRP of $79.99. Monster battles and classic adventures of Digimon have captured a special place in the hearts of millions of fans and continues to stand as an enduring global pop culture phenomenon since it premiered in the 1990s. On Tuesday Dec. 5, Shout! Factory, in collaboration with Toei Animation, presents the new anime feature “Digimon Adventure Tri.—Confession” on Blu-ray, Blu-ray/DVD/Digital and DVD. Produced by Toei Animation, the animated adventure appears for the first time on DVD in North America. Tai and his friends are haunted by the infection that resulted in Meicoomon destroying Leomon. All the Digimon are quarantined in hopes that answers can be found and the infection can be stopped. Unfortunately, one of the quarantined Digimon is already showing symptoms. The movie includes both Japanese and English audio. The bonus feature is the Anime Expo 2017 premiere panel with cast members Joshua Seth, Colleen O’Shaughnessey and Jeff Nimoy. In an act that’s far from despicable, Front Row Features is giving away a copy of this year’s No. 1 animated comedy, “Despicable Me 3,” on Blu-ray/DVD Combo Pack to five lucky readers so they can enjoy the film with their little Minions this holiday season. To enter the contest, simply email socalmovieeditor@aol.com by Monday Dec. 11 for your chance to win. Good luck! Next PostPhotos: ‘Transformers’ films on 4K UHD, ‘Despicable Me 3,’ ‘Midsomer Murders,’ More on Home Entertainment … Plus a Giveaway!! !